If you are providing care for a loved one—whether by helping out periodically or providing 24-hour care or something in between—you give so much of yourself to color the days brighter for others. 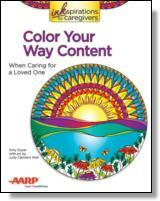 Now with Color Your Way Content, you can give yourself the much-needed gifts of relaxation and creative expression. Coloring can provide crucial help for caregivers. It has been shown to reduce stress, improve mood, and evoke a state of mindfulness. And it's perfect for busy caregivers because it can be done anytime, anywhere. You can do it for short bursts of time when you need a mini break, or for longer spans of time when you are waiting at an appointment or in need of some deeper relaxation. Color Your Way Content offers 31 stunning original designs, from free-flowing florals and meditative mandalas to endearing animals, pretty paisleys, and more. With a special lay-flat binding and perforated tear-out pages for sharing, this book offers a portable way to enjoy a creative and fun escape. Every day is a blank canvas. Spending time with Color Your Way Content can inspire you to paint your days with the vibrant colors of creativity, positivity, and joy—vital survival skills for caregivers. Creative coloring is a restorative way for you to fill your own tank so you have the energy to keep on caregiving and living your life to the fullest each and every day. AARP and HCI have teamed up to create a very special line of Inkspirations coloring books for adults celebrating creativity, playfulness, and living life to its fullest.